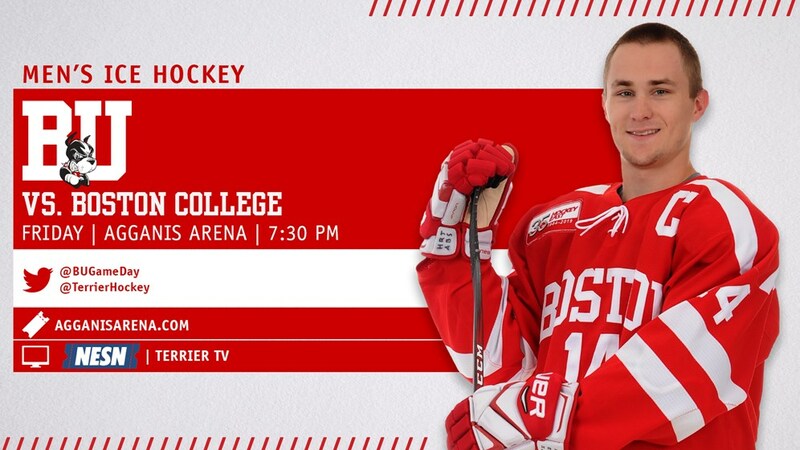 The Battle of Commonwealth Avenue resumes tonight as BU and BC start a home-and-home series at Agganis Arena. Puck drop is set for 7:30 p.m. The game will air on NESN in New England and there is a livestream on TerrierTV for those outside New England. It also will air in Canada on TSN2. The Terriers and Eagles will be meeting for the 278thtime tonight with BU holding a 135-124-18 (.520) edge. It will be the first time both teams will bring sub-.500 records to the game since Nov. 30, 2007—exactly 11 years ago. 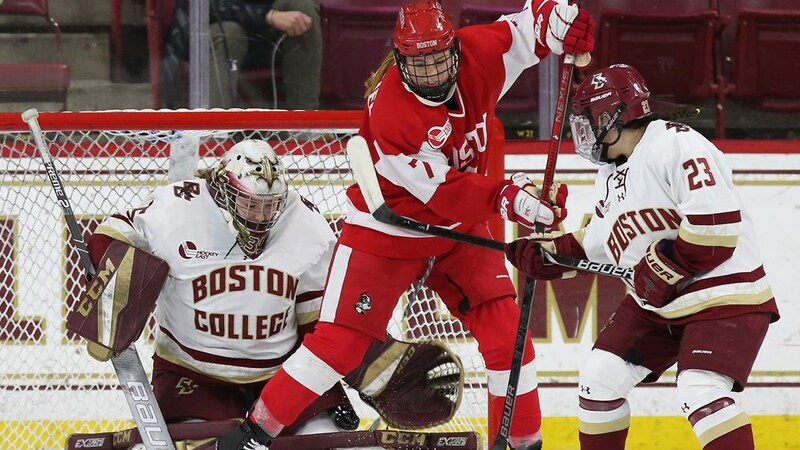 Like BU, BC enters the game following a loss, 4-2 to Bentley. The Eagles offense is led by junior David Cotton with 14 points and a Hockey East best 10 goals. Sophomore Logan Hutsko has nine points and junior Julius Mattila has seven. Junior goalie Joe Wall brings a 2.59 GAA and a .909 save percentage into the game. After a slow start to his season, Jake Oettinger, who earned Hockey East’s Defensive Player of the Week honors last Monday, has a .939 save percentage and a 1.99 GAA in November. Co-captains Dante Fabbro and Bobo Carpenter pace the Terrier attack with 12 and 9 points respectively. 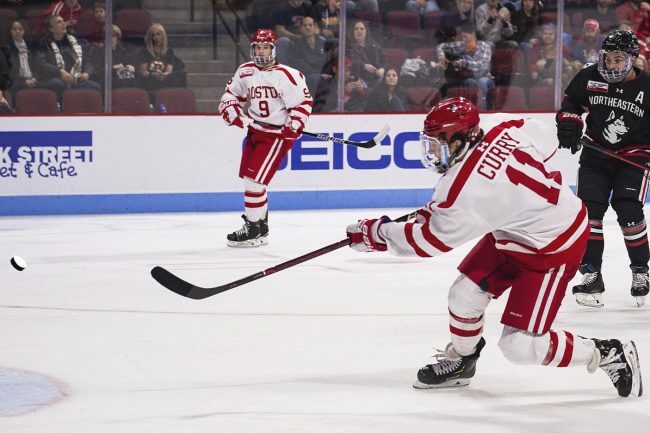 Junior Patrick Curry (photo) scored his fourth goal against UConn last weekend, matching his total for last season that included the overtime winner against BC in the Hockey East tournament semifinal. ►The Battle of Comm Ave is also the Battle of Watertown as both O'Connell and BC's Jerry York are Watertown natives. ►The Friends of BU Hockey Lounge will be open following the game to all FOBUH donors. 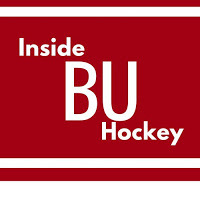 This week's episode of Inside BU Hockey features Bernie Corbett’s interviews with Head Coach Albie O’Connell and longtime college hockey writer Scott Weighart, who has written feature articles for USCHO and GoTerriers.com and also authored "Burn The Boats" chronicling BU's 2008-09 national championship season. 2020 recruit Cade Webber scored a goal for The Rivers School in an opening game 4-2 win against St. Sebastian’s, whose roster includes 2019 recruit Liam Gorman and 2020 recruit Liam Connors. Earlier this month, Webber, a 6’6” defenseman, joined the NTDP U18s for the Five Nations Cup in The Czech Republic and also joined the U18s for their exhibition games against BU and Harvard in October. In the NeutralZone Prep pre-season poll, Rivers, coached by former BU All-American and NHLer Shawn McEachern, is ranked #9, while St. Sebastian’s is #6. 2021 recruit Jeremy Wilmer added six points in Portledge School’s 7-4 win against La Salle. Playing for the NJ Avalanche 16Us, he leads the Tier 1 Elite League with 37 points in 13 games. 2021 recruit Danny Zhilkin showed off his speed and skills at the 2018 Silver Sticks tournament. Zhilkin, playing for the Toronto Marlboros Minor Midgets has been projected as a top pick for the next OHL draft. Fellow 2021 recruit Roman Schmidt also played in the Silver Sticks for Don Mills Flyers who reached the championship game. Playing in his 400th NHL game, Alex Chiasson continues to put pucks in the net, producing his 11th goal in 19 games. Chiasson also boasts a gaudy 35.5% shooting percentage, best in the NHL for skaters who have played at least 10 games. Colin Wilson scored his seventh goal in Colorado’s 6-3 win against Pittsburgh. Matt Nieto added an assist for the Avs. Clayton Keller scored his seventh goal of the season as Arizona blanked Nashville, 3-0. Terriers begin a home -and-home series with #4 BC tonight at Conte Forum. Puck drop is at 6 p.m.
● Daily Free Press recap of 5-2 win against Brown. Sophomore Jesse Compher has been invited to the USA Hockey Winter Training Camp next month in Plymouth, Michigan. The camp will help determine Team USA’s players for the 2019 IIHF Women’s World Championships.